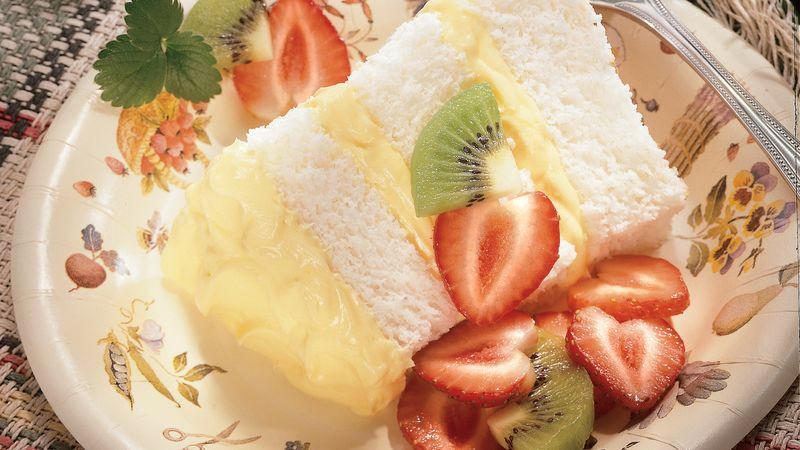 Cut angel food cake horizontally into 3 layers. Place bottom layer, cut side up, on serving plate. Place lemon pie filling in medium bowl; stir until smooth. Fold in whipped topping. Spread 1/3 of lemon mixture on bottom layer of cake. Top with middle layer of cake. Spread another 1/3 of lemon mixture over middle layer; add top layer. Frost top of cake with remaining lemon mixture. If desired, cover and refrigerate until serving time. In another medium bowl, combine strawberries and kiwi fruit; cover and refrigerate until serving time. To serve, cut cake into 12 slices. Spoon 1/3 cup fruit over each slice of cake.